John Deere invented the utility vehicle category in 1987 with the introduction of the five-wheeled AMT 600/622. 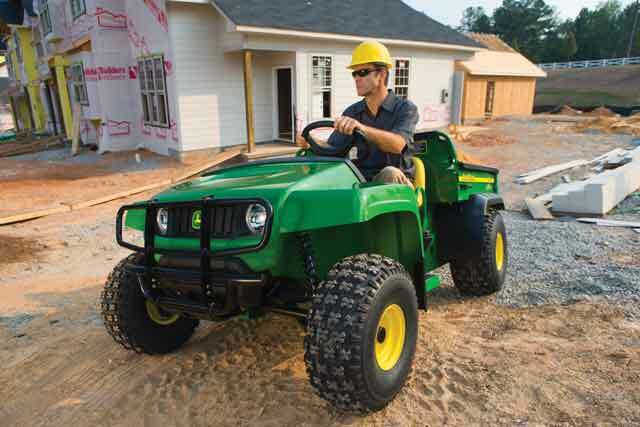 In 1992, the first John Deere Gator models came to market. Between 2007 and 2011, John Deere launched its cross-over category with the XUV 620i, XUV 625i, XUV 825i, XUV 855D and the XUV 550 and 550 S4. In 2013, two heavy-duty, four-seat models were introduced. John Deere currently has 14 models (in many iterations below) geared for the commercial contractor. The XUV 825i is the most popular Gator on the market today, says Deere. This four-wheel-drive, heavy-duty model features a 16-ft cargo box that can convert to a flatbed and has numerous attachment options and storage. In 2016, John Deere introduced the XUV 590i and XUV 590i S4 to the market. The Gator CX is a 4×2 model with an 8.5-hp engine. The Gator TS features 11 hp and a large cargo capacity combined with a light footprint on turf. The Gator TX features an increase in horsepower from the TS (15.5 hp) and delivers more torque, low-end lugging power and faster acceleration. The 4×2 model delivers a well-cushioned ride with a specially tuned four-wheel suspension. More power, more capacity and more wheels on the ground highlight the Gator TH 6×4 gas (15.5-hp) and diesel (18.5-hp) models. The Gator HPX 4×4 is the fastest work utility vehicle in the Gator lineup with a top speed of 25 mph, but it’s also the most terrain capable with true four-wheel drive and a dual range CVT transmission. The TX and TH models come equipped with a deluxe cargo box that has 16.4 cu ft of capacity, 20 integrated tie-down points and converts to a useful flatbed mode. For more information, visit johndeere.com.